The natural radioactive contaminants of the atmosphere are 222Rn, its progeny, and, to a much lesser extent, the cosmogenic 3H and 14C. As far as is known, the latter two radionuclides have always been present in the atmosphere, but their rates of formation have not been constant over long periods of time (tens of thousands of years) owing to variations in the intensity of cosmic radiation, especially that of solar origin. Long-term changes in the 14C/12C ratio in the atmosphere resulting from changes in the earth's magnetic field are shown in Figure 14-1. Short-term variations are assumed to arise from variations in the solar component of cosmic radiation. FIGURE 14-1 Long-term variation in atmospheric 14C activity as determined from tree rings. 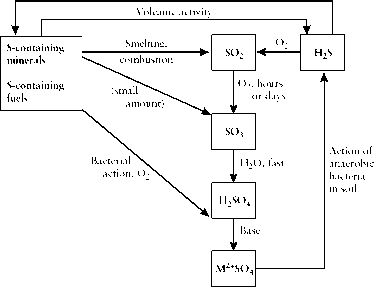 Adapted from G. Choppin, J. O. Liljenzin, and J. Rydberg, Radio-chemistry and Nuclear Chemistry, 2nd ed. Copyright © 1995. Reprinted by permission of Butterworth-Heinemann, Oxford. with the atmospheric testing of nuclear weapons in 1954, there was an increase in 14C (5715 y) concentration caused by the 14N(n, p) 14C reaction [reaction (14-2)], with neutrons released in atmospheric testing of nuclear weapons, especially "H-bombs." (Section 14.11.1). Before testing, the 14C content of plants and animals was 0.22 Bq/g of carbon (6pCi/g). By the time atmospheric testing of nuclear weapons ended in 1963, the concentration of 14C had risen to about double the natural value, as shown in Figure 14-2. Tritium (12.32 y) in the atmosphere is present as HTO and is in equilibrium with HTO in water on the earth that is in contact with the atmosphere. Prior to 1954, the tritium content of the biosphere was estimated to be about 900 g or about 0.33 EBq (about 9MCi). Its concentration is sometimes expressed relative to 1H in tritium units, where 1 TU = 13H atom per 1018 atoms of 1H. For water, 1 TU is 122Bq/m3 (3.3 pCi/liter). The level of 3H in rainwater increased from the range of about 0.5 to 5.0 T U before 1954 to values as high as 500 T U after the testing of tritium-containing thermonuclear weapons. From the effects of weapons testing on 3H concentration, the residence time of 3H in the stratosphere has been estimated to be 2-4 years. Tritium is washed from the troposphere in about 2 months. 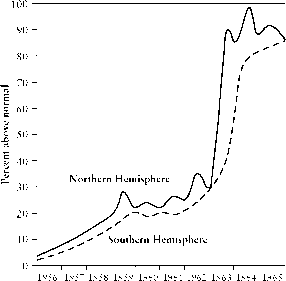 FIGURE 14-2 Increase in tropspheric 14C from atmospheric testing of nuclear weapons. Normal air was taken to contain 74 x 105 atoms of 14C per gram of air in 1954. Adapted from Report of the United Nations Scientific Committee on the Effects of Atomic Radiation (UNSCEAR), Supplement No. 14 (A/6314). United Nations, New York. Copyright © 1966. Used by permission of the United Nations. Radon, predominantly 222Rn (3.8235 d) in the uranium series, is present everywhere in the earth's atmosphere because it is a descendent of 238U, and uranium is an ubiquitous element. Although the main source of radon in the atmosphere is radon in soil, radon dissolved in spring water or well water that has been in contact with rocks or soil or sediments containing uranium also escapes when the water is exposed to the atmosphere. At any one location the concentration of radon in the atmosphere varies diurnally and seasonally and changes rapidly with atmospheric conditions. A typical value for 222Rn in the United States is about 5.6 Bq/m3 (0.15 pCi/liter). Worldwide concentrations have been reported to be from 4-18 Bq/m3 (0.1— 0.5 pCi/liter). For 220Rn (55.6 s), a member of the thorium series, the value is about 0.7Bq/m3 (0.02pCi/liter).